From col. F. M. Woodruff. Copyrighted by Nature Study Pub. Co., 1897, Chicago. N the Missouri river region and in contiguous parts of the interior of the United States, the Belted Piping Plover is a common summer resident, and is found along the shores of the great lakes, breeding on the flat, pebbly beach between the sand dunes and shore. It is the second of the ring-necked Plovers, and arrives in April in scattering flocks, which separate into pairs a month later. It strays at times into the interior, and has been known to breed on the borders of ponds many miles from the coast. In New England, however, it seldom wanders far from the shore, and prefers sand islands near the main land for its nesting haunts. Nelson says, that some thirty pairs, which were breeding along the beach at Waukegan, within a space of two miles, successfully concealed their nests, for which he made diligent search, although the birds were continually circling about or standing at a short distance, uttering an occasional note of alarm. Their nests are without lining, a mere depression in the sand. The eggs are usually four, light gray to creamy buff, finely and rather sparsely speckled or dotted with blackish brown and purplish gray. The female Belted Piping Plover is similar to the male, but with the dark colors lighter and less in extent. The young have no black band in front, while the collar around the neck is ashy brown. These interesting and valuable game birds are found associated with various beach birds and Sandpipers, and they become exceedingly fat during the latter part of the summer. All the Plovers have a singular habit when alighting on the ground in the nesting time; they drop their wings, stand with their legs half bent, and tremble as if unable to support their bodies. In this absurd position they will stand, according to a well-known observer, for several minutes, uttering a curious sound, and then seem to balance themselves with great difficulty. This singular manœuvre is no doubt intended to produce a belief that they may be easily caught, and thus turn the attention of the egg-gatherer from the pursuit of the eggs to themselves, their eggs being recognized the world over, as a great delicacy. No nest is found, the Plover flies! THE BELTED PIPING PLOVER.—Aegialitis meloda circumcincta. Range—Missouri river region; occasionally eastward to the Atlantic coast. Nest—Depression in the sand without lining. Eggs—Four, light gray to creamy buff, finely speckled with blackish brown and purplish gray. Even though these birds make nest right out in the open, the Lord has given them the instincts and knowledge to protect themselves and their young. He does not leave them defenseless. Jim Fenton did a great job capturing these little birds. I especially like the one below. That little one is under not only the shadow of both wings, but the whole body. Aren’t we like that sometimes? We feel like we need lots of protection and love from our Savior. Today this bird is known only as a Piping Plover and is in the Charadriidae Family of Plovers, Dotterels and Lapwings. Currently there are 67 species assigned to the family. 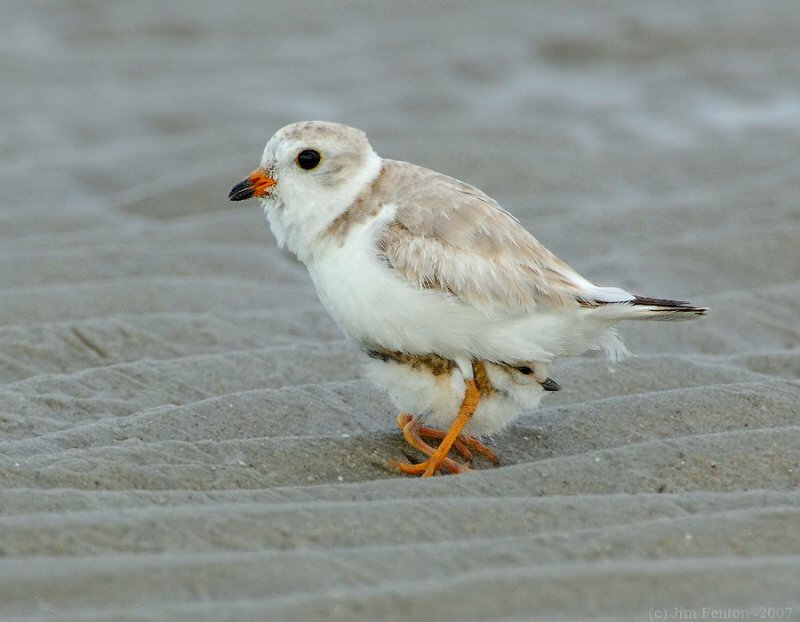 According to What Bird, “Piping plovers will sometimes extend one foot out into wet sand and vibrate it to scare up food items, a foraging technique known as foot-trembling.” That may explain the trembling mentioned above. They also use the “feigned broken wing” like Killdeers to lure predators away from their nests. You can listen to their call here: Piping Plover. Wikipedia says, “The Piping Plover (Charadrius melodus) is a small sand-colored, sparrow-sized shorebird that nests and feeds along coastal sand and gravel beaches in North America. The adult has yellow-orange legs, a black band across the forehead from eye to eye, and a black ring around the neck. This chest band is usually thicker in males during the breeding season, and it’s the only reliable way to tell the sexes apart. It is difficult to see when standing still as it blends well with open, sandy beach habitats. It typically runs in short and stops. There are 2 subspecies of Piping Plovers: the eastern population is known as Charadrius melodus melodus and the mid-west population is known as Charadrius melodus circumcinctus. The bird’s name is derived from its plaintive bell-like whistles which are often heard before the bird is visible. On average, circumcinctus is darker overall with more contrastingly dark cheeks and lores. Breeding male circumcinctus shows more extensive black on forehead and bill-base and more often shows complete breast-bands. Some overlap exists. Their breeding habitat includes beaches or sand flats on the Atlantic coast, the shores of the Great Lakes, and in the mid-west of Canada and the United States. They nest on sandy or gravel beaches or shoals. These shorebirds forage for food on beaches, usually by sight, moving across the beaches in short bursts. Generally, Piping Plovers will forage for food around the high tide wrack zone and along the waters edge. They mainly eat insects, marine worms, and crustaceans. Piping Plovers migrate north in the summer and winters to the south on the Gulf of Mexico, the southern Atlantic coast of the United States and the Caribbean. They begin migrating north beginning in mid-March. Their breeding grounds extend from southern Newfoundland south to the northern parts of South Carolina. They begin mating and nesting on the beach in mid-April. After a chick hatches it is able to feed within hours. The adults’ role is then to protect them from the elements by brooding them. They also alert them to any danger. Like many other species of plovers, adult Piping Plovers will often feign a “broken wing display”, drawing attention to themselves and away from the chicks when a predator may be threatening the chicks’ safety. The “broken wing display” is also used during the nesting period to distract predators from the nest. A major defense mechanism in the chicks is their ability to blend in with the sand. It takes about 30 days before a chick achieves flight capability. They must be able to fly at least 50 yards before they can be considered as fledglings. 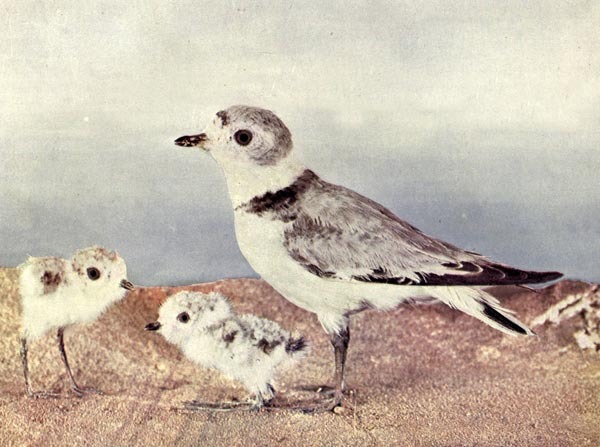 This entry was posted in Birds, Birdwatching, Christian, From The Past and tagged Birds Illustrated by Color Photography, Charadriidae, Home School, Kids, Photography, Plover, Under His Wing, Vol 2 #5 Nov 1897, Youth. Bookmark the permalink. What a lovely bird! And isn’t it amazing that they can create their nests right in the sand and yet hide them well enough that this expert could not find them easily? God’s plans and care for each of His creation is so awe-inspiring. I went over to listen to its song. Very pretty and clear. Thank you, Sandra. The Lord provides their protection in “open view” yet “hides it”. Glad you were able to see the Lord creation to encourage your day.